WeChat last week rolled out a handful of what it calls “mini-games,” lightweight games that work only within WeChat and don’t require downloading or installing. The most popular one, 跳一跳 (Tiao Yi Tiao), instantly went viral across China. Players try to control a minion jumping between blocks without falling off. Part of the reason Tiao Yi Tiao has become so addictive is that it is extremely social. Users can compare their scores with their friends’ on a leaderboard. 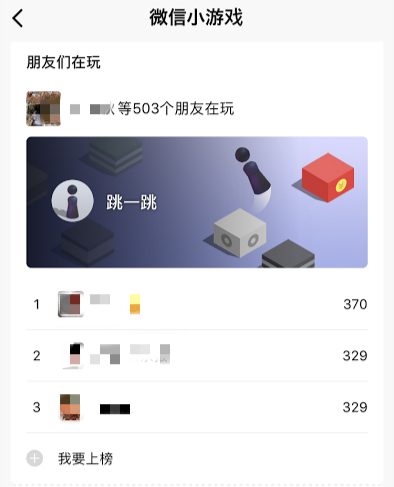 Before Zara played her first match of Tiao Yi Tiao, she could already see that 503 of her WeChat friends had played this game, followed by the ranking of these friends by their scores. The move comes almost exactly a year after WeChat rolled out its “mini-programs” – apps within WeChat that don’t need to be downloaded and installed. Most startups in China, in addition to apps, now also offer WeChat mini-programs. For example, half of all Mobike users have accessed the bike-sharing company’s mini-program, which has similar functions as the full-fledged app. (Tencent is an investor in Mobike). In the new version of WeChat released last week, the app added new features that made mini-programs more accessible and powerful. One of the most popular industry categories for mini-programs is e-commerce. Mini-programs are deeply integrated into users’ social networks on WeChat, making them well suited to social e-commerce companies like Pinduoduo and Mogujie, two of the most-used WeChat mini-programs. In our view, WeChat is becoming closer to an operating system. For Chinese users, the difference between iOS and Android is not huge—since everything is done on WeChat. Even though WeChat doesn’t do commerce itself, it seems to be exploring other ways of introducing commerce onto the platform through initiatives like the mini-program. Hellobike, one of China’s top three bike-sharing startups and a GGV portfolio company, has raised $150 million in series D2 funding led by Fosun Group with participation from GGV and others. Three weeks ago, Hellobike completed its series D1 funding round, taking in $350 million from investors including the Alibaba-affiliated Ant Financial Services Group. As of December, Hellobike offered services in over 150 Chinese cities, with more than 88 million registered users and 10 million rides per day. Hellobike’s 28-year-old CEO, Yang Lei, has taken an extremely data-driven approach to expanding the business, said Jixun Foo, managing partner at GGV Capital, who led our investment in Hellobike. As a relatively late entrant into the market, Hellobike was able to grow rapidly by first expanding into third- and fourth-tier Chinese cities, where bike penetration is lower, the average commute is shorter, and public transportation is often lacking. Meituan-Dianping, the world’s fourth-largest startup by valuation and an aspiring “super app” in China, has launched its taxi hailing service in seven major Chinese cities, including Beijing and Shanghai, after testing the feature for 10 months. To encourage new taxi drivers to sign up, Meituan also launched a promotion in which it will not take a cut from rides, leaving drivers with more profit to take home. Meituan already provides a myriad of services, including restaurant reviews and booking, food delivery, hotel and travel booking, and movie tickets. When people go out to restaurants, take vacations, and visit entertainment facilities, they are likely to need a ride. Hence it is no surprise that Meituan has ambitions in ride hailing. Meituan raised $4 billion this October at a valuation of $30 billion from investors including Priceline and Tencent. The company has a 200-person business unit dedicated to ride hailing and says it has reached more than 100,000 rides per day. Besides ride hailing, Meituan is launching pilot programs in other new businesses as well, including Airbnb-like short-term rentals and supply chain finance. China’s ride hailing industry is currently dominated by Didi Chuxing, a GGV portfolio company, which announced that it had completed a $4 billion financing last week. The latest round reportedly gives Didi a valuation of $56 billion, which is likely comparable to Uber’s current valuation. Our take is that Meituan seems to be spreading itself pretty thinly, but it makes sense for the company to target all the high-frequency activities of its value-conscious consumers. Note: Meituan-Dianping is the result of a 2015 merger between Meituan and Dianping. Hans Tung, managing partner of GGV Capital, is a personal investor in Dianping. The speakers will also share job opportunities at their companies. 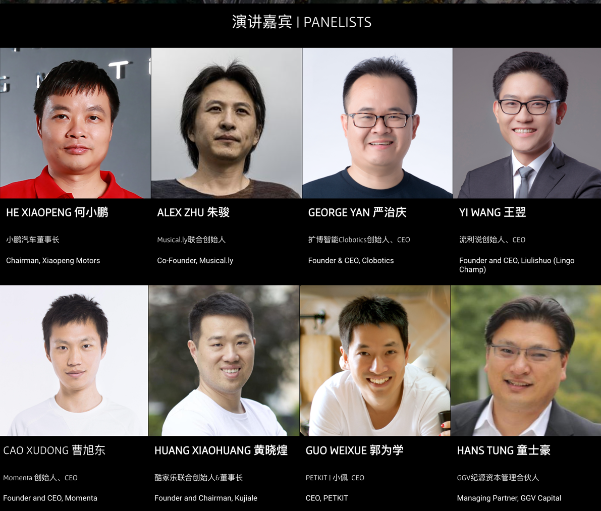 This event will be in Chinese. Space is limited; please register at the link below.